Recently we mentioned that the press is worried about us because we are not getting in line, rolling up our sleeves and getting a flu shot. Last year, only 29 percent of people aged 18 to 49 got the vaccine and roughly 42 percent of the population gave in to vaccination. The good news is that no matter how hard they push, we still have a choice. Unless you are a health care worker in Colorado. And if these folks are losing their health freedom--is ours next? Last year, a full third of health care workers across the country decided not to get the flu vaccine. Now shouldn't that tell us something? If they are refusing it, isn't it worth following their example? The Alliance for Natural Health points out that health care workers who refuse the flu shot do so because of several concerns. 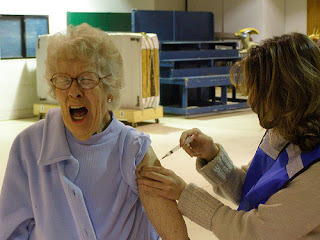 The flu shot still contains mercury, which has been linked to Alzheimer's. It's never been proven safe or effective. A study that shows that people who got the flu shot were more likely to be infected with H1N1 than people who skipped it. Also they know there are much safer ways to fight the flu, including immune-system boosters like vitamin D.
Back in Colorado, these health care workers aren't being trusted to make their own decisions based on their own research and observations. Nope--if they don't get the shot by the end of this year, they're fired. Yep. You heard it right. Fired. Either line up like sheeple to have an iffy drug injected into your bloodstream, or lose your job. Big Pharma want's us to believe that "protecting" health care workers means "protecting" us all. And don't ask Uncle Sam for help. They just dumped $400 million into the hands of vaccine makers like Novartis and GlaxoSmithKline to pump out drugs under the guise of "preparedness protection." Not only that, they have even set up laws to to protect manufacturers from lawsuits in case someone has an adverse reaction. So the end result is that Big Pharma comes out the major winner--and we all come out major losers. This is an attack on civil rights. The hospital has already made allowances for people with medical reasons to avoid the shot: They can wear a mask. So why not extend that to all people who don't want to be vaccinated? Probably because paper masks don't make Big Pharma any money, do they?